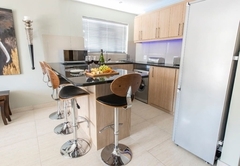 Doric 005 is a property providing self catering in Green Point for up to 2 guests visiting the Atlantic Seaboard region. 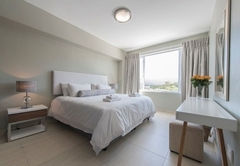 Doric 005 is a lovely, modern, one bedroom apartment with a front facing view over Green Point Main Road. 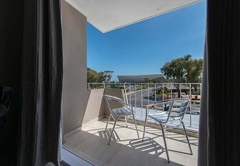 When staying at Doric 005 you are close to the beach, many great restaurants, cocktail bars, shops, the city centre and much more. 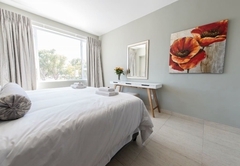 This is the ideal place to be based during your visit to Cape Town and all it has to offer. The apartment sleeps two guests in one bedroom with a king sized bed. There is a separate bathroom with a shower and all linen and towels are provided. 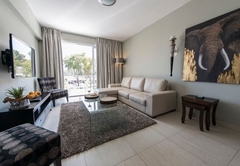 The apartment is light and airy with a stunning lounge area boasting a corner couch, two seats and a flat screen TV with selected satellite channels. The kitchen has a breakfast bar with bar stools where you can enjoy your meals. The kitchen comes well equipped with everything you will need, including a washing machine for convenience. Outside on the balcony there are two chairs and a great view of the Green Point Stadium. The apartment has air conditioning and there is Wi-Fi available on request. 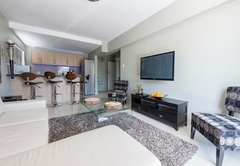 The complex has secure onsite parking and an elevator for easy access to your apartment. 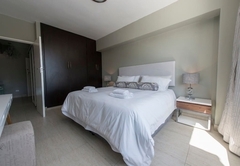 Stylishly fully furnished One bedroom One bathroom self- catering apartment in Green Point. Apartment offers secure parking. Response timeDoric 005 typically responds to requests in 5-10 minutes.